Do ya remember back in November when I showed y'all this antique lamp I saw while out antiquing with my mama? Well I LOVED this lamp the moment I saw it. I hemmed and hawed over getting it. They wanted $75 for it which I honestly did not think was a bad price seeing as it appeared to have all of its original crystals and it included the awesome script lamp shade which I knew would run at least $35 and up on its own. Mama said to ask if they would go down on it cause she knew it had been there for months. It was at one of the little shops she frequents often. I asked and they said no. So we left and went to another shop around the corner. Needless to say we went back to get it! I do not normally spend that much on lamps but I HAD to have this lamp! It was just perfect for the guest bedroom. I love its scrolly base! And my oh my does it have some bling! I ended up changing out the large script shade when we got home. It was just too large for the lamp. Thankfully I had this smaller one from Better Homes & Garden that I got awhile back at WM for just $10! I think it was made for this lamp. Soooooo pretty! 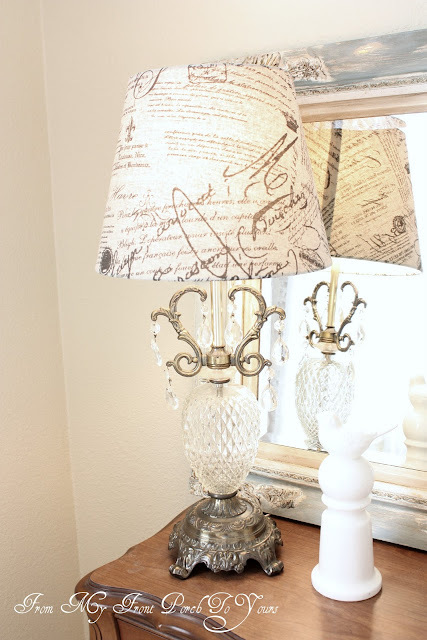 Love the crystals and the lamp shade fits perfectly! Sometimes you have to splurge to get a quality piece that will last forever:) Great find! So glad it was still there Pamela - it was meant to be yours. And it is truly beautiful! She's a beauty! You are such a tease I can't wait to see what you did to the mirror. From these pics its going to be fab. I think you made a smart purchase and are right about the change of shade. The smaller one is better. I see one of those fabulous mirrors that you have already given your special touch to and cannot wait to see it! I'm excited for you that you found them and such a fabulous price too! Wow! I know what is behind the beautiful new lamp and I know it's going to be breath taking!!! Sometimes you just got to pay the price if you want it bad enough! The lamp is so pretty and it looks much better with the smaller shade! Blessings from Bama! I was going to say they switched out the lampshade on you, Pamela! : ) I like the one you replaced it with and you've always got the bigger one to use somewhere else. I see what's back there! I think that's the color I'm hoping to mix up for my master dresser. Can't wait to see the full reveal! It's beautiful! Love the new shade on even better than the first, good choice!